Authentic "Glow in the dark" frames are now available in Blue, Yellow, and Green, Now new RED Color! frames for only .25 cents above the regular eyewear price listed. These Frames are not only U.V. Blacklight reactive, but a Special "GLOW" Plastic that is light retentive. 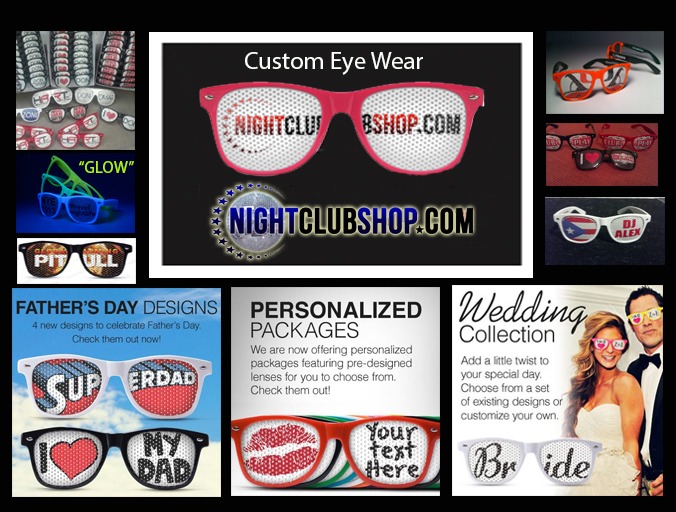 Nightclubshop Promotional Glasses/Lenses always deliver the very best in custom printed promotional sunglasses with unparalleled customer service.Take advantage of Social Media! Our custom printed promotional sunglasses offers the perfect platform for promoting your events and business by displaying your logo, artwork or messaging directly on your target audience, to be worn many times over. Party-goers and event guests not only wear these branded lenses at your event, but also later as they go about their daily life, posting photos on social networks, and spreading your message virally beyond your venue or initial event. Our printing process uses high-quality perforated vinyl and eco-solvent inks that makes our eyewear waterproof and extremely durable. These Customized Promo Units come only in Bulk Packages that start at 20 units and up. These individual prices are for 1=100Pack (100) units per Package. Custom Printed Wedding Sun Glasses and Party Shades available with 2-3 Day Turnaround.